Lynn Squire is hosting Fiction Friday today at her blog Faith, Fiction, Fun and Fanciful. Since I have an author spotlight going with Tammy Barley, I didn't post any fiction but you can pop over to Lynn's for hers and for links to others. Happy Friday!! Tammy Barley has lived in 27 cities and town in 8 states (so far), including the West and the South, and has ridden horseback across deserts, mountains, and halfway across Arizona on a 10-day trip, one of the unforgettable adventures of her life. In her family tree you’ll find James Butler "Wild Bill" Hickok, Ralph Waldo Emerson, and Henry David Thoreau. Any wonder she writes Old West and Civil War era romances? When she isn’t writing fiction, she works freelance as a biographer, editor, ghostwriter, writing mentor, writes and publishes devotional series, and is a fiction contest judge. You can keep up with Tammy at her website www.tammybarley.com. In 1863, the War Between the States is dividing more than a nation. To escape the conflict, Jessica Hale and her family flee their Kentucky home and head for Nevada Territory. Her brother, Ambrose, committed to the Confederates, rejoins the Kentucky militia and is disowned by his father. But the worst is yet to come. Here's an excerpt from Love’s Rescue. She was going to lose him. With trembling fingers, Jessica Hale pushed back the brown tendrils of hair the wind was whipping into her eyes. Further down the road, her brother handed the last of his cases to the driver on top of the stagecoach, then tossed his hat through the window onto a seat with an air of resolve. He turned and strode toward her. His wavy, wind-tossed hair gleamed brightly in the morning sun, its sandy hue like gold coins dulled intermittently by shifting dust. His sky-blue eyes—eyes that gleamed with subtle mockery or shone with patient understanding—now attempted to disguise unspoken regret. He smoothed a hand over each of the sorrel coach horses and calmly took in the young town he was leaving behind. Jessica knew better. He was going to miss this—the town, their parents. But his heart called him home. Ambrose was every inch a Kentucky gentleman. He always had been. Her throat tightened. She couldn’t help but smile. Jessica. Like always, he spoke her name with that deep, flowing timbre that made her think of the brook they had often played in as children. Jess sighed in frustration but complied, letting her head fall against his shoulder as they walked. At the edge of town, she looked back at Carson City’s wide streets, lazy with the long, morning shadows of tall buildings and newly built frames that smelled of sawn wood. One by one, other pedestrians appeared, striding briskly; then came rattling wagons, kicking up trails of dust this way and that. The wind whipped at Jess’s skirt and Ambrose’s coat, cavorting among the silvery green desert sage leaves that fluttered around them. The sights and sensations that usually intrigued her had amalgamated into one frolicking, singing fool, playing cruelly to her burdened heart. Jess’s gaze followed the road out of town, then lifted to rest on the peaks that rose high above. The Mexican people called these mountains the Sierra Nevadas—the snowy mountains. When she had come West with her family a year before, Jess had thought them magnificent. In a wild, untamed way, they reminded her of the Kentucky homeland they had left behind. Instead of the rolling green hills and broadleaf forests she had always known, the Sierras jutted boldly from the desert like a rare stone half buried in sand. Depending on the angle of the sun, their terrain was a glorious red or gold. For a moment, Jess merely breathed, drawing in the fresh scent of the pinyon pines that dotted the distant slopes and mingled with the earthy aroma of sage. Only a few months ago, winter had prevailed, and so had the glittering snows on the Sierras. Ambrose, dear Ambrose—had understood her need to be outdoors. He’d convinced their father a time or two to excuse him from work, then would take her riding amid the stark beauty of the mountains. Jess frowned, pushing back strands of hair that had torn from their heavy twist and were stinging her eyes. A brusque but shrewd businessman and horse breeder from Lexington, their father had brought the family West to escape the growing turbulence in the South, and here, his import business thrived. With the recent discovery of untold millions of dollars in gold and silver buried in the land, the eager-to-be-rich swarmed to the Comstock from every major seaport in the world. Those fortunate enough to strike a vein of the mother lode scrambled to Hale Imports to stake their claims in society by acquiring French wines, Venetian glassware, Turkish carpets, and handcrafted furnishings made of dark German wood. A golden dream for many, perhaps, but not for Jess. Her family had considerable wealth, but possessions beyond life’s basic comforts didn’t matter to her. What did matter were her father, her mother, and her brother, Ambrose, and the strength they had always given one another in face of the threat of war between North and South. And the threat had become considerable. Jess tightened her grip on Ambrose’s arm. He patted her hand reassuringly. country like the unstoppable waves of the sea. Miners and other men in town chose sides as the conflict loomed nearer. Heated political discussions often erupted into fistfights in the streets. In the same way, tension had escalated within the Hale family as their loyalties divided. And now, Ambrose was about to return to Lexington—against his father’s will—to rejoin his militia unit. It was predicted that war would break out within a year. Two days earlier, when Ambrose had announced to Jess and their parents his intent to fight for the South, Jess had stood strong—stunned but unflinching. The announcement was followed by two days of her father and brother yelling and her mother pleading. A lifetime of paternal love was burning to cinders. Their father was still so angry about his son’s decision that he had refused to see him to the stage stop, coldly disallowing all but the briefest of good-byes between mother and son. Jess’s legs nearly gave out. “Keeping his accounts is your job!” Ambrose wasn’t coming back at all—not even after the war. She really was going to lose him. Jess’s throat ached to beg him to stay. Their friendship was special, rare, in spite of growing up together amid talk of secession and war. Or perhaps because of it. She wanted to keep her brother close—and safe. Yet she forced down the urge to give words to her feelings. Ambrose’s blood flowed for Greenbriar, for Lexington. A year away hadn’t changed that. Yes, she loved him. Enough to understand that. Enough to let him go. Broderick had died as a baby, when Jess was only five. Even now, she could clearly remember holding her little brother as his fever raged, could remember how helpless she had felt when she’d lain awake at night listening to his pathetic coughs in the nursery down the hall. Jess had been devastated when he died, but their mother…their mother had never been the same. Her joy and laughter Jess knew about only because Ambrose had told her of the way she had once been. Gratitude battled concern in his face as he studied his sister, but Jess knew that he also understood firsthand the inborn loyalty that drove her. “Just be careful you don’t jeopardize your relationship with him on my account,” he said. There was a movement near the stagecoach. A mailbag was slung aboard. Jess’s heart lurched. It was almost time for him to go. Another movement drew her gaze. The coach driver climbed into his seat. Ambrose hurried toward the stage, Jess’s hand tucked in his. At the door, he pulled her into his arms and hugged her warmly. He kissed the top of her head, briefly hugged her tighter, and then stepped away. The driver cracked the reins and the six-in-hand pulled the stage away from Carson City, away from her. Jess watched until the coach disappeared through a pass in the mountains. Keep him safe, Lord, she prayed. Whatever lies ahead, please keep him safe. It was all she could do not to run for her horse and go after him. His colonel’s rapidly scrawled reconnaissance report was secured in a leather pouch tucked into his waistband. It was the only warning Bragg would have that the Yankee advance at Frankfort was merely a diversion, and that the whole of General Buell’s Union army was, in fact, moving toward Bragg’s position. Buell meant to take Kentucky. The enemy was fifty-five thousand strong. Sixteen thousand up against fifty-five. Ambrose whipped a sleeve across his forehead to blot the sweat seeping from underneath his hat. If he didn’t reach Bragg in time for the general to pull back and regroup, Kentucky would fall to the Federals—and to their torches. Ambrose tilted his head to hear the distant pum, pum of cannon fire. Fields dotted with white and blue wildflowers blurred by. This was his home, his land, and now, Greenbriar was his, too. Ambrose frowned as he recalled the letter written by his stiff-necked, outraged father—the sole one he’d sent—in which he had given him Greenbriar. His father intended the house as an accusatory monument to the heritage he believed his son had betrayed by ultimately fighting for the South. But to Ambrose, if Greenbriar survived the war, it would again become his home, his livelihood, and the place his old bones would be laid. He yearned to fall in love there, to marry there, to raise children amid all its gurgling streams and grassy paddocks. Children who would love it as he always had, and as Jess had. captivated his heart. As she grew, it was to him that she would come for comfort and advice; with him, she shared her inmost thoughts. He had taught her more about the person she could become than their parents ever had, and she had matched his strength and dedication toward those whom she loved. Now, Jess was his proponent and confidante. She wrote to him as often as he wrote to her, discreetly hiding his letters from their father. He knew many of their letters never made it through enemy lines since, in letters he did receive, Jess frequently referred to events he was unaware of, as well as to war news he had previously penned. Even so, they both persisted in sending them. As promised, she patiently worked to sway their father’s heart toward his son. And she remained firm in her belief that her brother would survive the war. His mind turned to the letter he had written to her only a few hours ago. He imagined her reading it at night by candlelight, the flame’s glow illuminating her casually knotted hair, highlighting the loose strands she rarely bothered with. He could almost hear the smooth flow of her Southern voice as if she were reading it aloud. war and dream of what I will do after. and tell her of my unflagging determination to return to you all. Then, as Grandfather would have wished for me to do, I will come back home to Greenbriar and rebuild what the war has ruined. I’ll fill its paddocks again with the prized horseflesh that has always graced its lands. Startled, Ambrose entered a town huddled beneath a haze of smoke. Perryville! The mare was slick with sweat and foam, but she had a bold heart, the likes of which he’d rarely seen in an animal. Spying a cluster of saddled mounts, Ambrose halted before a red brick house. The gray tugged at the reins while he listened to a soldier’s instructions on how to find General Bragg. Ambrose immediately headed northwest on the river road. The roar of battle grew deafening. Yankee wounded and dead lay scattered over the hills. He topped a rise. Below, gray-clad soldiers swarmed through thick smoke into the enemy, several falling beside their comrades. All around, cannon shells burst in sprays of jagged metal and earth. Urging the mare along a path behind the lines, Ambrose ducked the whizzing cannon fire. He pulled out his leather pouch and withdrew the message. A cannon shell exploded, and a terrible pressure struck his chest. The mare screamed. Groaning through his teeth, Ambrose clung to her neck. To the west, rifles barked flashes of orange as men in blue and gray surged into their enemies. Ambrose pressed forward, searching the high ridges for the familiar starred collar and white-streaked beard of General Bragg. Ambrose kicked the gray forward with all the strength he had. Fortunately, she lunged in response, not wavering at the unsteady weight on her back. Ambrose fought through the thickening fog in his mind and gripped the dispatch tighter. A sudden burning burst along his thigh, and the smoky daylight and soldiers’ movements began to dim. Beneath him, the mare pulled ahead, pitching like a rocking chair. He imagined the stern face of General Bragg turning in surprise as he approached. He felt himself reaching out to her, to Jess. Wanting to see her one more time, to tell her how dear she was to him, had always been. He was fading. The message. He couldn’t feel it. Did the general receive the message? Ambrose no longer knew what direction the mare took but threaded his fingers through her mane, imagining he was weaving hands with Jess. No sky fell under his eyes; he saw only a lone field of dappled gray, oddly crossed with streams of red. You can purchase Love's Rescue from Amazon and CDB. Tomorrow is an interview with Tammy Barley. See ya then! The trailer makes me think I'm living in the West. Such depth to the storyline just from the trailer. A 'gotta' read book! Hi Tami (great name, btw--is it short for something?) and hi Carmen! Thank you so much for stopping by! Until the end of the year when the price of Love's Rescue goes up, it's only $6.99 at most bookstores, only $4.99 through ChristianBooks.com. If you go there and click on books, then fiction, then historicals, Love's Rescue is currently #11 on their bestseller list on the first page. Very affordable! WOW! I sure hope I win this book! sounds great! Love books written in the late 1800's. Keep on jumping, Joy--you're touching hearts for God with your enthusiasm for Him; you're also entered to win a copy of Love's Rescue! Would love to read this one. Thanks for the chance to win a copy. Greetings, Cherie! You are entered! You're welcome! It's very much my pleasure. 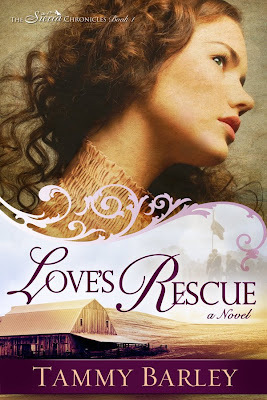 I want to read Love's Rescue, it sounds terrific! Can't wait to learn more about Tammy in her interview tomorrow! IF I'm already a subscriber to your blog do I still get an extra entry? :-D Just wondering!!! Thanks for these great contests and interview! Hi, Renee! It's good to see you here. Here in Illinois it's after noon and the countdown until it's officially weekend has begun! Don't you love Fridays? Why can't every day be Friday? LOVED the trailer! Looks like a great book. Sign me up! I love books set at the time of the civil war. Such an interesting period in history! Hi, Rose! You are signed up! The trailer is as fantastic as the book. I did love reading this book. It sounds great!! Loved the interview and I would love to win. Abby, you are entered to win a copy! Thank you, Abby! It's been a great week so far!